The big pink Kenny with Shane ‘Zoom’ Kissell and True Ross. Ross Transport is a family-owned and operated trucking business kicked off in 1975 by Reg Ross and his wife Frances Ross. 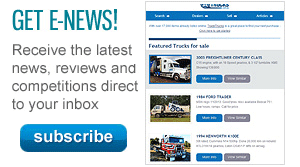 The company is now proud to boast three generations onsite, managing a fleet of 57 trucks and 110 trailers. Alan, son of Reg, now runs the business with his daughter True learning the ropes beside him as well as getting trucks of her own. It was True who first got behind the wheel of the swanky new T909, picking it up from the Kenworth factory in Bayswater, Melbourne. "We drove in the driveway and the pink truck was out the front," said True. "Usually when I collect a truck, it’s around the back, but we drove straight in and there it was. "It was the greatest thing ever." Locally designed and manufactured at the Kenworth Factory in Bayswater, the pink rig has ignited conversations among workers who had never before seen a truck that size painted in such a daring colour. 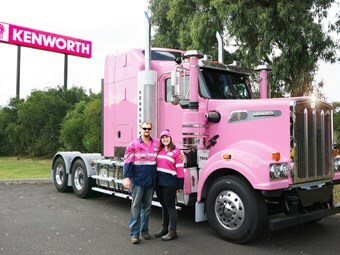 Working with a local paint supplier to find the right shade of pink, the Kenworth team and Ross Transport sparked questions wherever they went, which is exactly what they hoped might happen. When Kenworth parked the pink beauty out the front of the factory for True to collect, it began sparking a deeper conversation about women in trucking. On its maiden journey, from Victoria to Port Kembla on the New South Wales south coast, the freshly-painted pink truck attracted even more attention. "As we drove home, everyone was staring and calling us, saying how awesome it was," said True, proudly reporting she drove a small portion of the almost 12-hour trip, alongside driver, Shane ‘Zoom’ Kissell. Since then, Ross Transport’s Facebook page has been flooded with positive comments, from ex-employees who know the company well and truck enthusiasts who can’t get enough of the ripper rig. For the Ross family, there’s more than one reason behind the Pink Truck - there’s the Illawarra Convoy, which the company has been part of since its inception 11 years ago. "Dad and I thought a pink truck could support and promote cancer awareness in the Illawarra Convoy." Another reason was to celebrate the women in Ross Transport. True’s grandmother founded the company with her husband more than 40 years ago and today, she still pops in to do a few hours’ work every day, at the age of 75. "My grandmother has been part of the business for a very long time and we wanted to say thank you for everything she’s done. "We did it for her and for other women in the transport industry." True and her father also hope the truck will bring Ross Transport’s employees together. "Even though it’s pink, it represents all cancer. In the coming months, Alan and True hope to invite employees to write the name of any loved ones they’ve lost to cancer – like Zoom’s mother – on the back of the cab. "I think everyone’s been affected by cancer in some way, whether it’s a family member or a friend or themselves. "We’ve been told this is such a good idea – that it really brings people together." 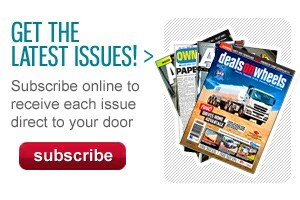 The truck will drive between Melbourne and Sydney, and may also travel to Adelaide and Queensland. "It’ll be going on quite the adventure," laughs True. "Everyone is excited and happy that we’ve done this!" Until then, you can follow the Pink Truck- now named Truly Frantastic, on Ross Transport’s Facebook page.